The Hill reports that Stone told reporters outside of a federal courthouse in Florida that he will go to trial over the indictment, saying that it is "incorrect" that he made false statements during his testimony before Congress.
" There is no circumstance whatsoever under which I will bear false witness against the president," Stone said, "nor will I make up lies to ease the pressure on myself." Following Stone's first court appearance on Friday, his bail was set at $250,000 and his travel limited to Washington DC, Virginia, New York and Florida (Stone can't leave the country, but his passport wasn't taken because, according to his lawyers, he has no valid passport). 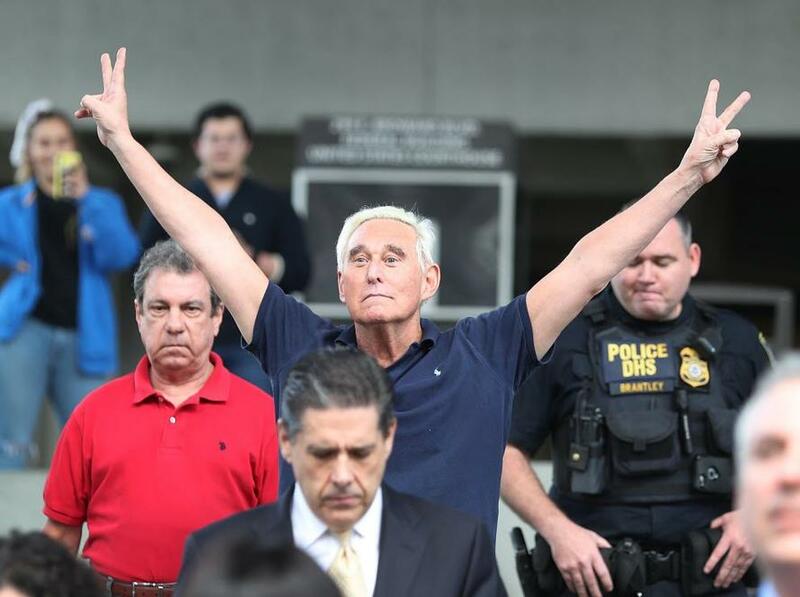 With rulings in the case about to accelerate, the Washington Examiner's Byron York has published a handy guide to the Stone indictment that aims to set the record straight. Instead of being a broad indictment of collusion between the Trump campaign and Russian-backed agents, the indictment sketches a picture of a man who had been pushed to the periphery of Trump World as the campaign locked up the nomination, who maybe ran his mouth a little too much. But importantly, Stone wasn't accused of directly coordinating with Wikileaks - indeed he had no advanced knowledge of the contents of the leaks. And he never lied in his interviews with Mueller, either. In the end, it appears Stone's big problem was his big mouth. He liked to brag about being behind all sorts of nefarious deeds when in fact he was not, or he had a tangential connection to them. That led to this chain of events: 1) Stone bragged in public; 2) the House committee asked him about his bragging under oath; and 3) Mueller investigated the veracity of Stone's sworn testimony. If Stone had not popped off about himself all the time, he probably would not have gotten himself in trouble. Count One alleges that Stone obstructed the House committee's investigation by denying he had emails and other documents about WikiLeaks-related contacts. During his House testimony, Stone was asked if he had "emails to anyone concerning the allegations of hacked documents ... or any discussions you have had with third parties about [WikiLeaks]?" Stone answered that he did not, when in fact he had a bunch of emails and other communications. The obstruction charge also alleges Stone attempted to prevent Credico from testifying or tried to convince him to testify falsely. Counts two through six concern specific statements to the House committee. Count Two is based on Stone's assertion that he did not have emails. Count Three alleges that Stone lied when he said that Credico was his only "go-between" to Assange, when in fact, Stone was also in contact with Corsi for that purpose. "At no time did Stone identify [Corsi] to [the House] as another individual Stone contacted to serve as a 'go-between,'" the indictment says. Count Four alleges that Stone lied when he said he did not ask Credico to communicate anything to Assange, when in fact Stone asked both Credico and Corsi to get in touch with Assange "to pass on requests ... for documents Stone believed would be damaging to the Clinton campaign." Count Five alleges that Stone lied when he told the House that he and Credico did not communicate via text message or email about WikiLeaks. Stone told the committee the two talked over the phone, when in fact, according to the indictment, "Stone and [Credico] ... engaged in frequent written communications by email and text message." Count Six alleges that Stone lied when he testified that he had never discussed his conversations with Credico with anyone at the Trump campaign, when in fact, "Stone spoke to multiple individuals involved in the Trump campaign about what he claimed to have learned from his intermediary to [WikiLeaks]." Count Seven is a witness tampering charge, alleging that Stone tried to convince Credico to take the Fifth or to lie to the House committee. Notably, the indictment doesn't allege that Stone had direct contact with Julian Assange (as media reports have suggested) and it doesn't allege that he had extensive communications with anybody in the Trump Campaign related to Wikileaks. Update 3: Roger Stone's terrible, horrible, no good, very bad day just got worse. According to media reports, Amy Berman Jackson, the same judge who presided in the case brought against Manafort in Washington, will be the judge overseeing Stone's case. Steve Bannon is the "high-ranking campaign official" referenced in the discussion of October emails in the 24-page indictment released today by Special Counsel Robert Mueller, according to a person familiar with the matter. The other two unnamed individuals in the indictment - Person 1 and Person 2 - are widely believed to be Jerome Corsi and Randy Credico. Update: Though nobody is saying the president did anything wrong with regards to Friday's indictment of Roger Stone (notably, the indictment didn't allude to any interactions between Stone and the president) Press Secretary Sarah Huckabee Sanders on Friday felt it appropriate to remind the media that the president "did nothing wrong" regarding the Stone indictment. Stone worked for dozens of Republicans, Sanders said, and the charges in the indictment have "nothing to do" with the president, she said during an interview on CNN. Asked if Trump directed the campaign official to contact Stone about the stolen emails released by Wikileaks, Sanders refused to speculate. She also said she wasn't aware of any heads up given by the DOJ to the White House about Stone's arrest (though clearly the DOJ felt comfortable giving CNN advanced notice). The arrest - which like many of Mueller's high profile arrests, occurred early on a Friday - isn't exactly a surprise: Stone has long said he expected to be indicted by a grand jury convened by Mueller. As reporters comb through the Stone indictment, one twitter user pointed out that Mueller had determined that Stone had been "contacted by senior campaign officials to inquire about future releases" of information stolen by Wikileaks from the DNC. Stone will make an initial appearance later Friday at the federal courthouse in Fort Lauderdale. Late last year, Trump famously tweeted a congratulatory message to Stone after the advisor said he would never testify against the president - something that is likely being scrutinized by investigators. The indictment, which was under seal until Stone was taken into custody, was handed down by the jury on Thursday. In a summary tweeted by WaPo's Aaron Blake, Stone was busted for lying about the nature of his contacts with his "intermediary" to Wikileaks (he had two intermediaries previously reported to be journalists Randy Credico and Jerome Corsi) and for lying about his communications with senior campaign officials and Wikileaks about the latter's upcoming releases of stolen emails. Stone raised eyebrows during the campaign for "predicting" the release of emails embarrassing to the Clinton campaign. He also allegedly asked a witness appearing before the House Permanent Select Committee on Intelligence to pull a "Frank Pentangeli", a reference to a famous scene in the Godfather II when a government witness pretends not to know anything about Michael Corleone's criminal activities during a Congressional hearing. Stone's requests to "Organization 1" - clearly identified as Wikileaks - were occasionally very specific, with Stone at times asking if Wikileaks had specific "dirt" on Hillary Clinton relating to incidents that occurred during her tenure as Secretary of State. The indictment also accuses Stone of keeping an individual affiliated with the Trump campaign apprised of Wikileaks' plans to dump emails stolen from the DNC and Hillary campaign chairman John Podesta. d. Later that day, on or about October 4, 2016, the supporter involved with the Trump Campaign asked STONE via text message if he had “hear[d] anymore from London.” STONE replied, “Yes - want to talk on a secure line - got Whatsapp?” STONE subsequently told the supporter that more material would be released and that it would be damaging to the Clinton Campaign. 22. During his HPSCI testimony, STONE was asked, “So you have no emails to anyone concerning the allegations of hacked documents . . . or any discussions you have had with third parties about [the head of Organization 1]? You have no emails, no texts, no documents whatsoever, any kind of that nature?” STONE falsely and misleadingly answered, “That is correct. Not to my knowledge." When pressed about how he had ascertained that Wikileaks was planning more dumps, Trump offered the HPSCI a misleading statement that minimized the role of "Person 1" - believed to be Jerome Corsi - in ferrying advanced knowledge of Wikileaks' planned dumps to Stone. Stone also reportedly lied to HPSCI about his correspondence with senior Trump campaign officials. The indictment implies that Stone's attempts to obtain the stolen emails from Wikileaks was done at the behest of a campaign official. After misleading the committee about his communications with his intermediaries, Stone allegedly tried to convince person 2 (Credico) to either make sure his testimony conformed with Stones, or to just plead the 5th and pretend he didn't know anything. Stone served as an official advisor to the Trump campaign shortly after its launch in 2015. He has publicly acknowledged exchanging messages with a hacker known as Guccifer 2.0 that the government has sought to portray as a front for Russian intelligence, and Stone once boasted about his contacts with Wikileaks, even calling its founder, Julian Assange, "my hero." Meanwhile, NBC News reported that roughly a dozen associates of Stone have been summoned to appear before Mueller's grand jury.